The focal point of our high-quality rosettes are buttons with a diameter of approximately 6 cm. The buttons are covered with a foil to prevent scratching. The buttons are available in any of the base colors. We can print your custom logo on the button or the middle streamer in gold or silver metallic. We already have logos of various associations available. If we don't have your logo readily available, you will need to send us a digital version of your logo with a resolution of at least 300 dpi, preferably in black and white. There is a one-time processing fee of 30 € (tax not included). We can also print a full-color logo or photo on white paper and use this as your button. There are no limits to the colors or the design you would like to use. For this, you will need to send us a digital version of your logo or photo with a resolution of at least 300 dpi. The price is an additional 0.50 € per button (tax not included). Buttons are available separately with a safety pin or as replacement buttons. The price is 0.50 € per button (tax not included). 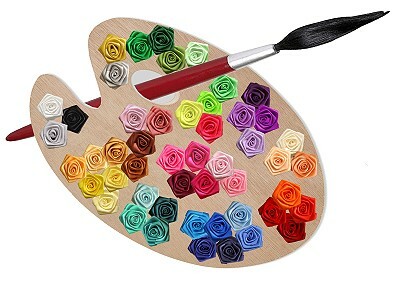 Alternatively, we can also produce satin roses for almost all models. You can find a list of available colors here. WE WILL BE HAPPY TO PROVIDE ADVICE OR ANSWER QUESTIONS. JUST ASK US!